George Ginnis and Jennifer Johnson of Aqua Ohio recently hosted the Struthers Rotary Club at its new operations facility, Castlo Industrial Park, 100 S. Bridge St. The five-acre site serves as the headquarters for Aqua Ohio’s Struthers Division. Aqua Ohio is the largest private water utility in Ohio and serves nearly 500,000 people in 19 counties. Johnson, Rotary president, is manager of the Struthers division, and Ginnis manages Aqua’s facility in Poland Township, which provides an average of 4.3 million gallons of drinking water a day to approximately 60,000 people in ten municipalities in Mahoning County. Aqua owns four lakes in the area and is one of the largest taxpayers in Mahoning County. The company is planning to complete $43 million worth of capital-improvement projects this year with $28 million being committed locally from 2017-21. Information on Aqua Ohio, including water conservation tips, can be found at www.AquaAmerica.com. 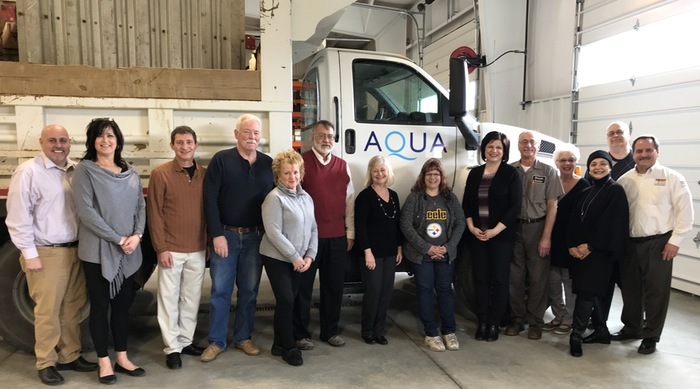 Above, from left, are Ginnis; Lynette Hardman, Aqua Ohio; and Rotary club members Don Gabriele; Chuck Campbell, president-elect; Denise Loboy; Drew Hirt; Linda Krestel; Darla Donahue; Johnson; Mike Krake; Mary Ann Morrell; Karen Edwards; Tom Baringer; and Bryan Higgins. December 21, 2017 12:02 a.m.